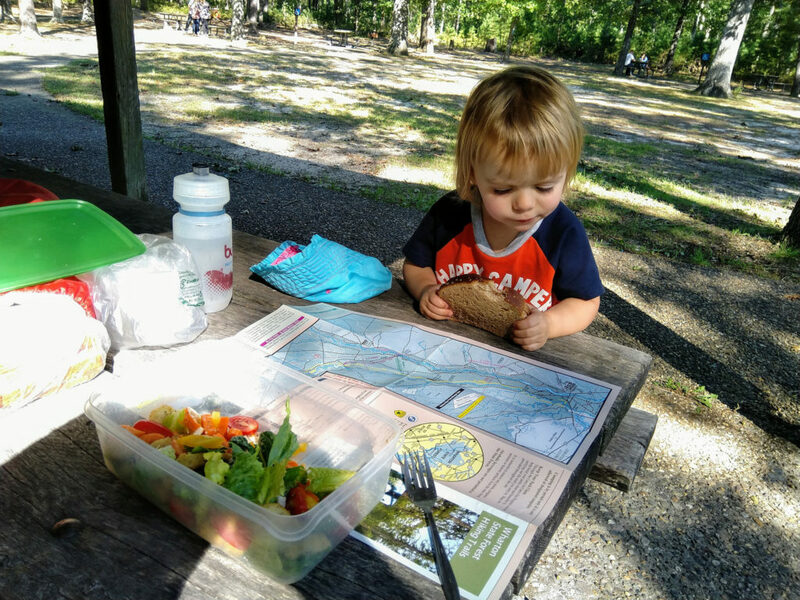 Alice and I started exploring a slightly different part of Wharton State Forest this weekend: From Batsto to Lower Forge and back on the Batona Trail. Studying the map because you can’t trust Dad to navigate. As expected, this was much like the Mullica River trails and camp we’ve been to several times now. 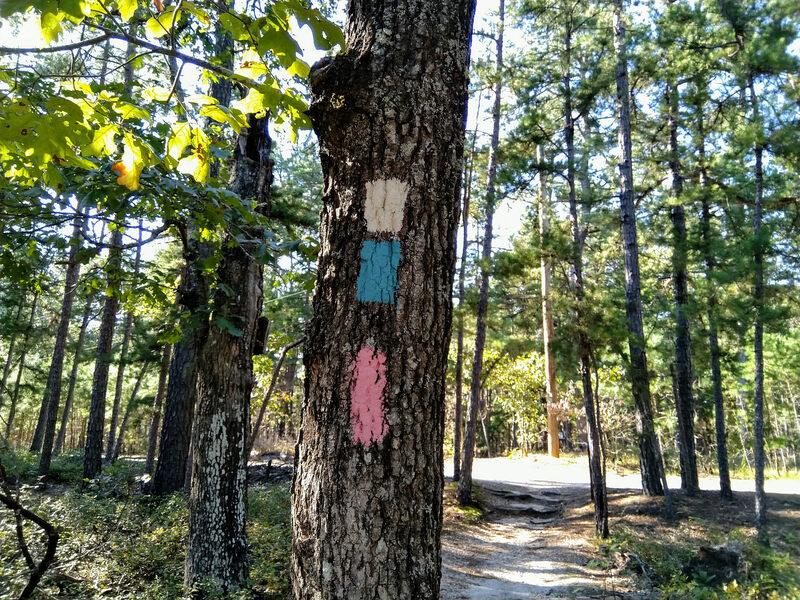 I probably prefer the first half of the Batona north from Batsto over the Mullica River Trail. The former must have been cleared by fire at some point. All the scrub and branches are gone, so you can see a long ways into the depths of the woods. It’s all dark black trees forming columns between vivid green grass and bright blue skies. Really very pleasant and colorful. 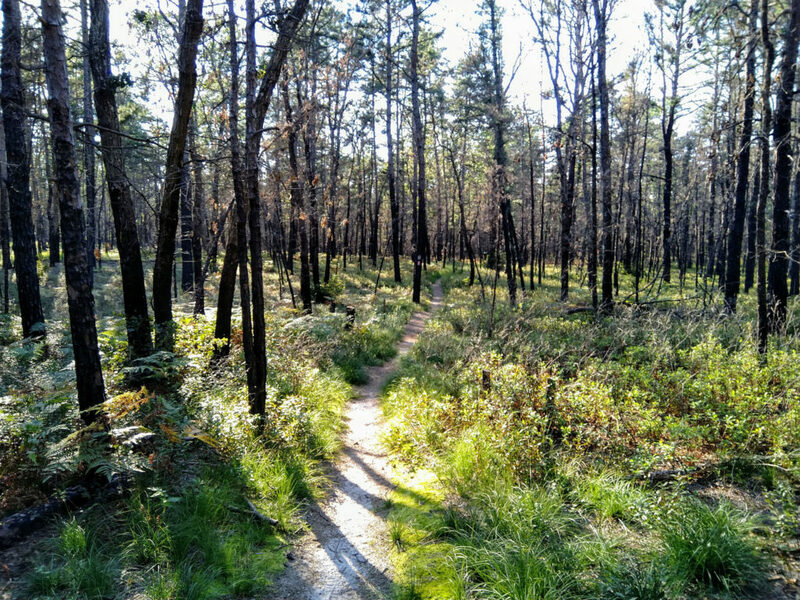 The second half though is more fire roads than the second half of the Mullica River trail. 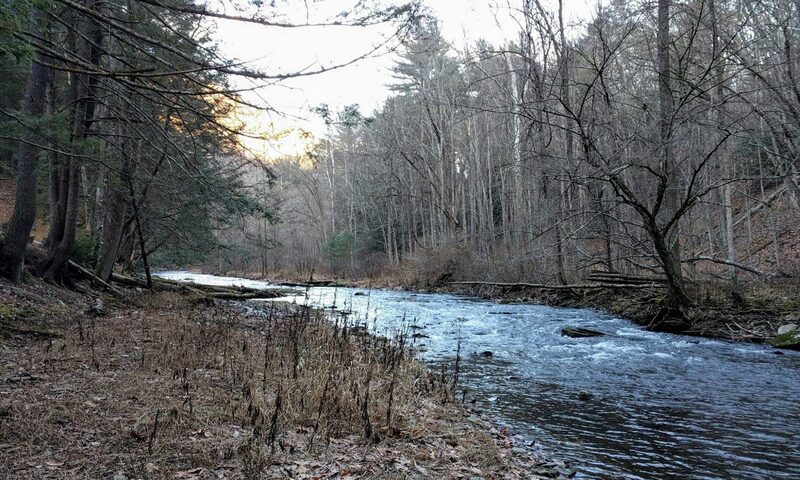 Lower Forge is quieter than the Mullica River camp area on the latter’s busy days. But it’s very small and the sites closely co-located, without scrub between them. So other people feel a lot more present. 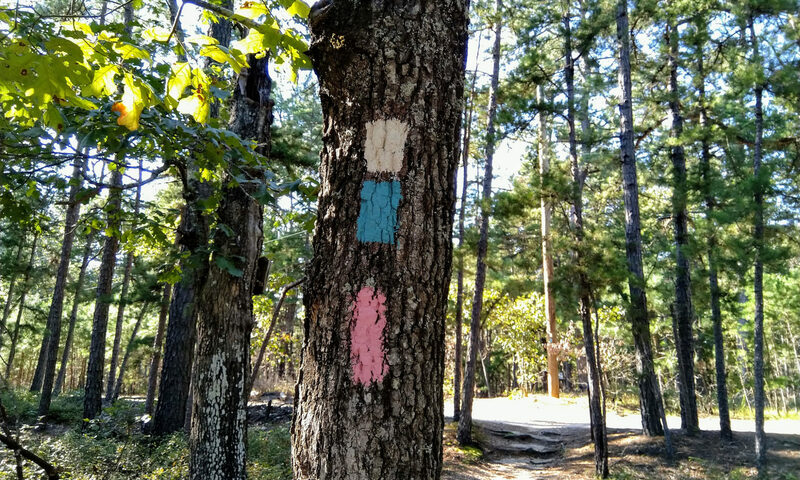 The Mullica sites are huge, accommodating the giant Boy Scout and other groups that go through there. So by sheer virtue of distance it feels a lot more empty even when there are actually people around. All that said, the trail and camp area were pleasant enough. Alice had a great many questions about the different kinds of trees. We had a long discussion about the differences between pinecones and acorns that eventually resulted in having to collect several of each, along with some rocks. 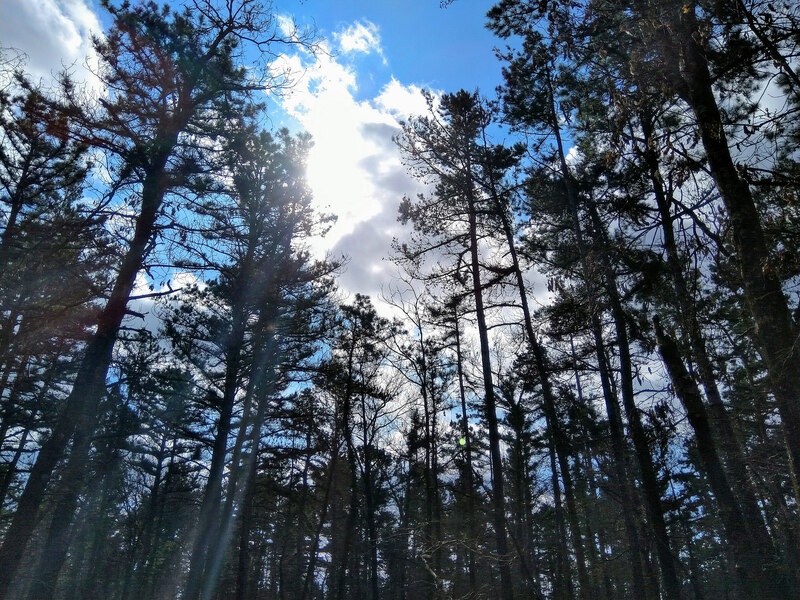 I had picked this trail for a couple reasons, including being close to the city, flat, and a distance neither too short nor too long (7.2 miles each way). But I also picked it for being blazed in pink, which Alice really enjoyed. She talked a bunch about different color combinations, and asked about the various overlapping trails and where they were going. Alice continues to pick up camping knowledge. Besides the tent, she knows where I stow the lights for easy access, and a little bit about stove operations. We got her a whole bunch of camping books recently, and she’s been reading them studiously. Maybe too studiously: One is about a little girl Rhoda and her rock hunt. 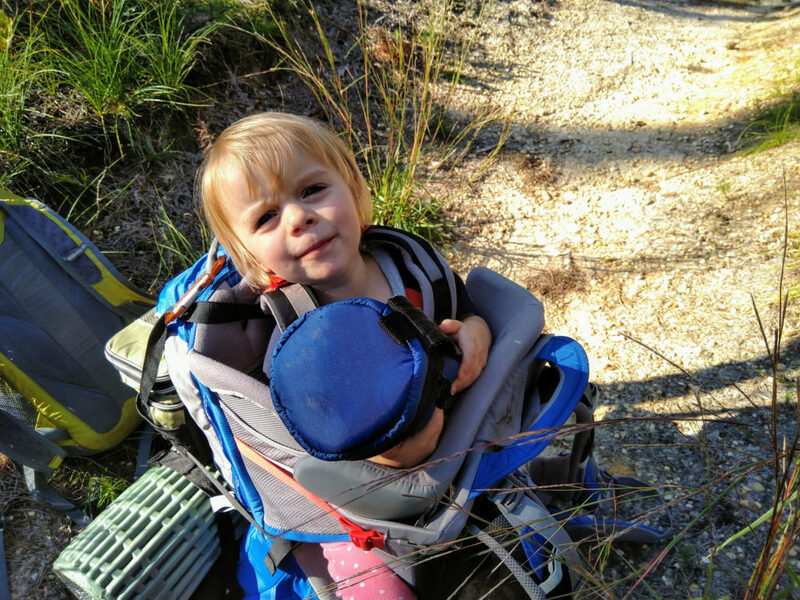 So Alice had to take a bag along on this trip for carrying rocks and “my other little things” (extra carabiners, a packing strap, and a pinecone).